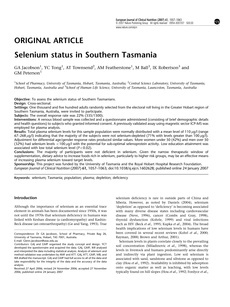 Objective: To assess the selenium status of Southern Tasmanians. Design: Cross-sectional. Settings: One thousand and five hundred adults randomly selected from the electoral roll living in the Greater Hobart region of Southern Tasmania, Australia, were invited to participate. Subjects: The overall response rate was 22% (335-1500). Interventions: A venous blood sample was collected and a questionnaire administered (consisting of brief demographic details and health questions) to subjects who granted informed consent. A previously validated assay using magnetic sector ICP-MS was employed for plasma analysis. Results: Total plasma selenium levels for this sample population were normally distributed with a mean level of 110 μg/l (range 67 μg/l) indicating that the majority of the subjects were not selenium-depleted (71% with levels greater than 100 μg/l). Adjustment for differential age/gender response rates produced similar values. More women under 50 (42%) and men over 50 (32%) had selenium levels <100 μg/l with the potential for sub-optimal selenoprotein activity. Low education attainment was associated with low total selenium level (P < 0.02). Conclusions: The majority of participants were not deficient in selenium. Given the narrow therapeutic window of supplementation, dietary advice to increase foods rich in selenium, particularly to higher risk groups, may be an effective means of increasing plasma selenium toward target levels.